With its central theme of motorbike and speed. ‘Wheels of Steel’ is an unashamedly macho album. Saxon make no concessions to the ballads that Whitesnake and Thin Lizzy used to their advantage and to bring hard rock to a broader demographic. Kick starting side one, ‘Motorcycle Man’ makes no secret of this with a blistering intro of revving engines tearing between the left and right speaker channels, before the double guitar assault of Graham Oliver and Paul Quinn pave the way with a hard staccato riff that could easily be described as proto-thrash. With a classic metallic edge and a sharp punky spirit, it’s easy to hear how this would have been a formative influence upon Lars Ulrich and James Hetfield prior to forming Metallica. The featured solos come with a suitably high octane spirit and Pete Gill’s heavy pounding drum style constantly pushes everything forward. Somewhere in the middle of the unrelenting riff, frontman Biff Byford wails like a metal titan, reinforcing the defiant masculinity of the piece, and while lyrics like “I’m a motorcycle man, I get my kicks where I can” could be dismissed as genre parody and somewhat clichéd decades on, at the beginning of 1980, they were responsible for cementing the foundations for a new and exciting movement in British metal. With more open road ahead, the title track kick is a natural successor to the wind-in-your-hair thrill ride of the debut’s ‘Stallions’, only this time, things seem far more structured. Hitting upon a metallic riff with a strong boogie rock undertone, the music comes across like an old AC/DC workout from ‘Let There Be Rock’, but with much bigger balls. The main guitar riff cares not for any fussy frills – it’s purely the sound of oil and sweat; something that, along with the universal theme of the open road should have made Saxon a Transatlantic success, but at the same time, there’s something about their honest delivery that belies its British working class origins. Biff is in terrific voice; on attitude fuelled statements like “I don’t take no bull” and “get out of my way” especially, he comes across as the ultimate 80s metal icon, to the point where his silver spandex can almost be audible on the recording itself. A howling guitar solo comes with a dirty edge and an almost bluesy wail, though never enough to dilute the pure hard rock sound and the simple but unshakable drum line sounds as if it could motor indefinitely. All things considered, it’s easy to see how it became a live staple and one of the numbers most associated with the band. If you’ve not had enough of speed and engines, the rather more frivolous ‘Freeway Mad’ brings power aplenty. Following a phased drum solo faded in as an intro, Saxon then throw themselves into a sharp boogie that sounds like a metal band channelling something from Status Quo’s classic ‘On The Level’ LP, only with extra speed and police sirens thrown in for good measure. It’s not big or clever, but it never pretended to be. Although it’s probably the album’s least essential track, the shared solos between Oliver and Quinn are fantastically fiery and the closing bars of furious solo guitar – sounding rather like the prototype for the end of Prince’s ‘Let’s Go Crazy’ – stoke up the already frenzied sound. ‘See The Light Shining’, meanwhile, is one of the album’s more overlooked offerings, perhaps due to a chorus that doesn’t tap into the title, but there’s plenty to love. 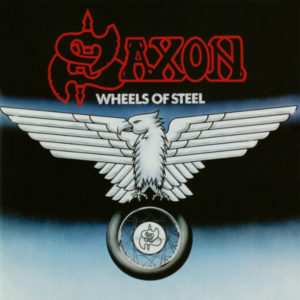 Biff attacks each line as if it could be the last time in the studio; the lead guitar sounds are brilliant and, best of all, Saxon manage to weld together two distinctly different musical ideas but make it all seem so natural. Something that begins as a metal tour-de-force in the vein of ‘Motorcycle Man’ switches gears midway to reveal fist pumping hard rock, very much driven by Steve Dawson’s hard bass sound. Quinn and Oliver eventually use this slower pace to trade off solos and it’s here – if you’d not noticed before – that their natural abilities to pre-empt each and really work together become obvious. In terms of guitar playing, it’s certainly an album highlight. More machismo cuts through the heart of ‘Street Fighting Gang’ (we should probably assume they’re a motorcycle gang, or at least know one), a track that delivers on just over three minutes of riffs with a great stereo split and another pumping bassline. With the drums pushing the fist-clenched energy even further, Biff is faced with a difficult task of not coming up short vocally. As a result he spends most of the track spitting each line in a suitable manner. The guitar solos are surprisingly short – more spiky interludes than genuine solos – but the trading of licks between Oliver and Dawson, as well as an unexpected bass rumble from Dawson, gives one of the album’s weaker numbers a really powerful climax, which has the effect of improving the number as a whole. More street tough vibes inform ‘Stand Up & Be Counted’, too, revisiting Saxon’s other favourite topic of being strong and sticking it to “the man”. Rather than the lyrics, though, its the music that makes this one really fly. From the outset, Quinn and Oliver tap into the kind of riffs that would truly define the New Wave of British Heavy Metal and the era in which this track was created; there are twin leads almost worthy of Thin Lizzy and a brilliantly punchy bass riff that’s clearly audible throughout. It’s music truly suited to Biff’s rallying cry – “you can make it” he opines strongly, before suggesting if we’re “down at the bottom” we can fight our way back, or that we shouldn’t be afraid to be seen “out in the spotlight”. We only get one go at life – let’s go through it with bravado and spirit might be a message of breeze-block subtelty, but it’s a perfect fit for the music. ‘Stand Up & Be Counted’ is one of the finest deep album cuts from the early Saxon ouvre, along with ‘Judgement Day’ and the epic ‘Dallas 1PM’. The fact that it conveys just as much power in half the time only adds to its all round greatness. Easily the most melodic track, hit single ‘747 (Strangers In The Night)’ recounts the tale of a Boeing aircraft seemingly doomed. It’s one of Byford’s best lyrics from the early years in terms of imagery and storytelling; he does a great job of conveying the peril in hand, using genuine concern instead of sheer histrionics. The music, too, is fabulous: the tougher edge of the riff looks back to 70s giants like Ritchie Blackmore, while a musical counterpoint highlighting Quinn’s higher registers comes with more of a Thin Lizzy-ish feel (tones that would really make later tunes like ‘Nightmare’ and ‘Mists of Avalon’ endlessly appealing). For metal thrills, this hard rocker isn’t left wanting of course, and the way the lead guitar rips through the speaker at the outset and in a couple of other places helps place the track somewhere near the top of important 80s metal recordings. While most of this album has aged surprisingly well, this single is a cut above; it sounds terrific. Also reaching for melody over speed, ‘Suzie Hold On’ is almost AOR-ish in its intent. More classic hard rock than burgeoning 80s metal, this track looks forward to the more polished band Saxon would become between 1985-88. While the more melodic rock aspects of albums like ‘Innocence Is No Excuse’ and ‘Destiny’ polarised fans, this early attempt at something more radio friendly gives ‘Wheels of Steel’ an interesting detour. It’s here Biff gets to explore the softer side of his voice, while a twin lead guitar break and some very measured drum work cement the idea that Saxon – even at this early stage of their career – aren’t just a metal band; they’re more than able to turn their hands to various kinds of rock successfully. Looking back, this should have been successful as a single, but it failed to chart, presumably because most interested parties had purchased the album by that point. At least with two top twenty hits about motorbikes and aeroplanes under their belts, nobody could accuse Saxon of selling out with melodic rock aspirations…yet. It’s back to the full speed for the album closer. Machine Gun’, an anti-war howl of anger that really thrills in terms of guitar riffs and furious vocals. If anything leaves a lasting impression, though, it’s Gill’s power behind the drum kit, along with the first round of solos where Oliver uses effects to make his six stringer sound like a killing machine – a stylistic trick that could’ve been inspired by a similar trick from Dave Hill on ‘Slade Alive’ a decade earlier. This is swiftly followed by a more traditional solo, accentuating the emotive piece with some superb fretboard mangling. As the band drop into the last round of riffs and Gill hammers at his bass drum pedal, the power in a Saxon live performance of the era is almost caught on this early studio recording. As the brilliant wall of noise fades, you’re left knowing that not only has almost every one of this album’s thirty nine minutes been used effectively – there’s absolutely no filler here – but someone, either the band or producer Pete Hinton, knows how to sequence an album for maximum impact. This entry was posted in Album & EP Reviews and tagged biff byford, hard rock, metal, nwobhm, saxon by Real Gone. Bookmark the permalink.